Philadelphia Union won 3-2 over the Houston Dynamo tonight with yet another stoppage time goal from Danny Mwanga. Sebastien Le Toux shot down the right wing and hit a low cross that Mwanga picked up on the doorstop and put into the back of the net. First ever road win for the Union. Great day for Philadelphia sports: This comes on the same day that Philadelphia Phillies pitcher Roy Halladay threw a perfect game, the U.S. national team beat Turkey in Philly, and the Flyers are currently tied at 5 in the Stanley Cup finals. If the Flyers can pull off a win, this might end up as one of the best days in Philly sports history. 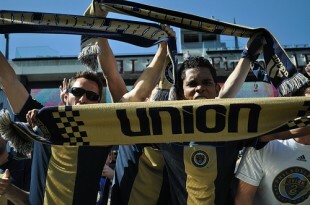 Check the Philly Soccer Page tomorrow for a more detailed look at the Union match. Go, Union! All the goals we scored were beautiful, Salinas terrorizing with quick dribbling before chipping the keeper, and great team play set up the shots for Le Toux and Mwanga, which they both finished clinically. Dynamo scored off of set pieces, in the air.